Enriched and Enhanced with Lavender and Neroli Essential Oils! Buy 1 for $19.45Buy 2 / Save $1.04!Buy 3 / Save $3.89! 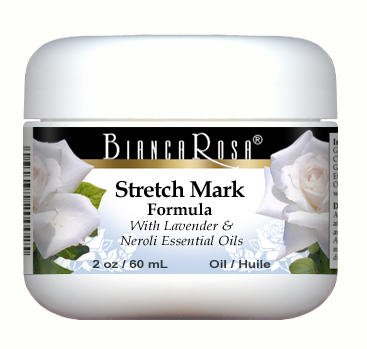 Bianca Rosa Stretch Mark Oil is specially formulated to help support the appearance of stretch marks caused by pregnancy, body building and rapid weight change, by replenishing the skin's natural supportive agents. This unique botanical formula also promotes healthy cellular regeneration to maintain ideal skin structure. Keep your skin looking great! Cleanse the skin with a mild soap and water and apply Bianca Rosa Stretch Mark Formula 1 Oil. Massage into affected area sparingly with gentle, circular motion. For heavier applications at night, cover skin with cloth or bandage to prevent staining of clothing, bedsheets, or linens. Apply morning and evening or as directed by a health care practitioner. Should skin sensitivity occur, discontinue use. Store in a cool dry place. Keep out of reach of children.